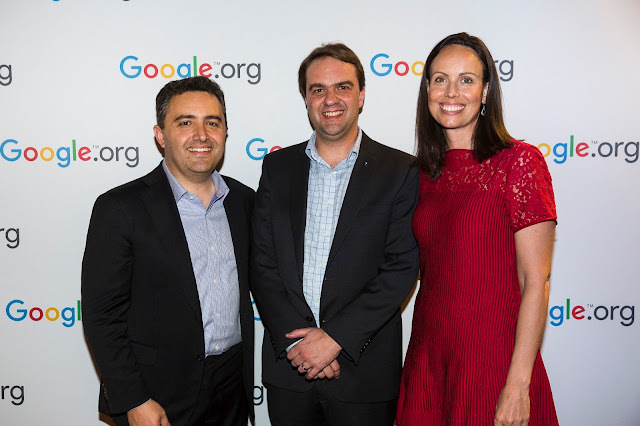 team in the world - no surprise given that Google Maps was born in Sydney; we are working to transform the way businesses operate in a digital world; we’re helping people in emerging economies make the most out of the internet in spite of poor bandwidth. We are also in a unique position to help others solve big problems using technology, and through our philanthropic arm Google.org we donate more than US$100 million and a further US$1 billion in products and resources every year to non-profit partners tackling some of the biggest social issues we face. Google Australia & New Zealand managing director Jason Pellegrino, Infoxchange chief executive David Spriggs and Google.org director Jacquelline Fuller. One of those partners is Infoxchange, which is transforming the way society tackles homelessness. 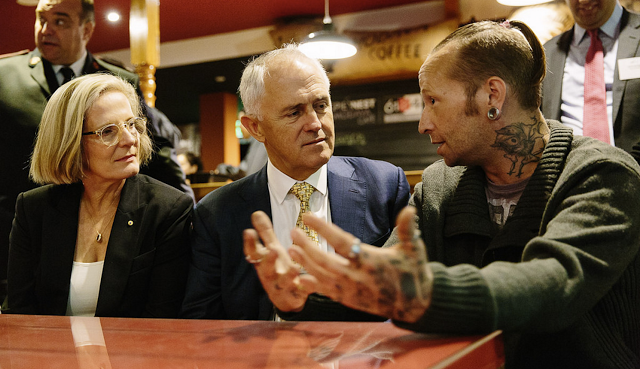 It’s hard to believe, but one in 200 people in Australia is homeless. You may also be surprised to know that roughly eight out of ten of those homeless people has a smartphone. For many homeless people their smartphone can play a decisive role in determining their outcome. Infoxchange saw the opportunity to provide people in need with location-based information via their mobile, helping connect them with essential things such as food, counselling, employment services, legal support and a safe place to sleep. Earlier this year it launched Ask Izzy, the world’s first, nationwide mobile website connecting people who are at risk with essential services. Ask Izzy was developed with support from Google, News Corp and REA Group. It is exactly the kind of problem-solving that motivates people at Google; not only did we fund the development, but a number of Google staff helped develop the technology and assist with user testing. The mobile site was co-designed by those who have experienced homelessness. It’s also free, anonymous, and the data usage costs nothing if you access it via Telstra’s network. The people at Infoxchange have been amazing partners because of their passion for the issue of homelessness, for the partners they’ve been able to bring together to make this project happen, and for their belief in the power of technology to make a real difference in people’s lives. Ask Izzy was launched in January by Australian Prime Minister Malcolm Turnbull, and has now been used more 250,000 times - many more times than Infoxchange expected. Launching Ask Izzy in January, Australian Prime Minister Malcolm Turnbull and Lucy Turnbull spoke with people who consulted on the design of Ask Izzy. The next step for Infoxchange and Ask Izzy is to create a national database that understands how people are using essential services so that policymakers can ensure they are available where they are needed most. This Christmas if you wish to donate to Infoxchange go to http://info.westpac.com.au/askizzy so they can put pocket-sized mobile phone chargers into the hands of homeless people - for just $15 you can ensure that when they need that little bit of extra charge for their phone, it’s there for them. A single power card will charge their phone for four hours. An extra phone charge in the pockets of people in need can help them find a bed, a shower, a meal, a friend. Even when we’re seeking to make big changes to society, it’s the small things that often matter the most. At Google we often talk about trying to solve the really big problems - connectivity, communication, organising the world’s information. Sometimes we take on ideas so large it could almost seem preposterous - like organising all the information on the internet, or using artificial intelligence to translate languages. Google has engineers in Australia working on all kinds of global problems. We have the largest Google Maps team in the world - no surprise given that Google Maps was born in Sydney; we are working to transform the way businesses operate in a digital world; we’re helping people in emerging economies make the most out of the internet in spite of poor bandwidth. We are also in a unique position to help others solve big problems using technology, and through our philanthropic arm Google.org we donate more than US$100 million and a further US$1 billion in products and resources every year to non-profit partners tackling some of the biggest social issues we face.